Oval vignette detail derived from the sheet music cover (below). 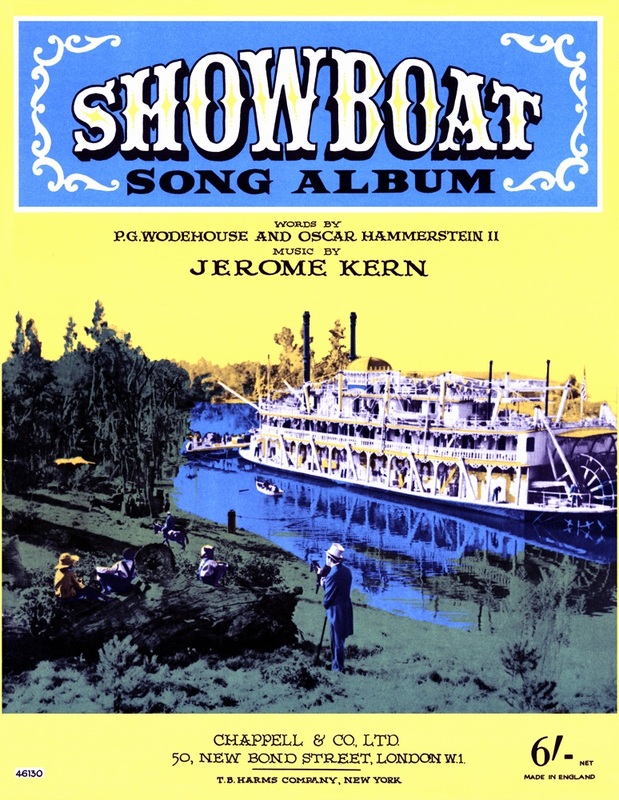 Murphy Library's photo of the Belle of Alton for comparison to the sheet music cover (below). This is one of the best of the reprints made by the Mississippi Lime Co. of Alton. 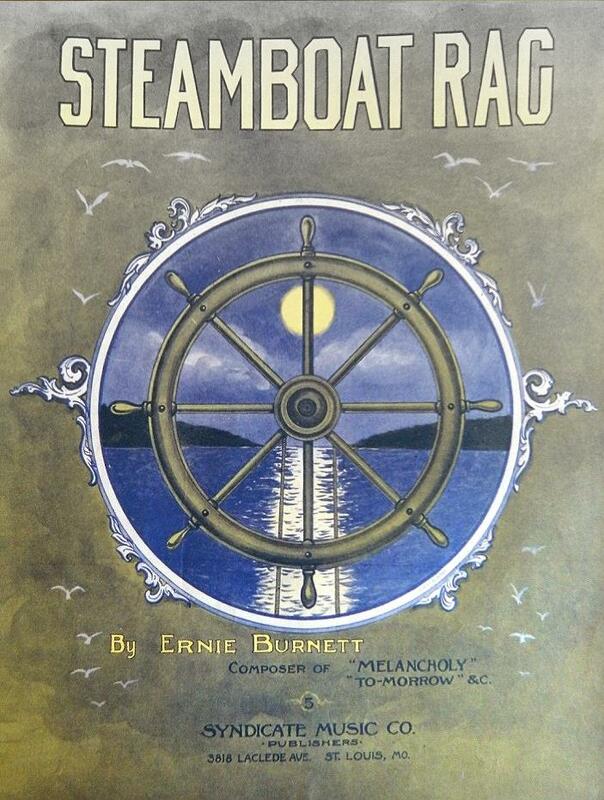 Original sheet music would have been published circa late 1860's. After looking at the Murphy Library's photo of the boat it seems that either artistic license was taken by the draughtsman or the boat was remodeled at some point. The art work shows a "double decker" cabin without a Texas under the pilot house. It's doubtful but possible that the Texas could have been embellished later by encircling it with a promenade deck but the only photo shows the boat with the standard single cabin with Texas above. Burned at Algiers, Louisiana, laid up, March 28, 1871. Her engineer, William W. Marsh, was jailed in New Orleans charged with arson, later released on $6,000 bond. At trial he was honorably acquitted. Hull was used as a barge. Hull burned at Vicksburg, November 18, 1873. When the whistles blow . 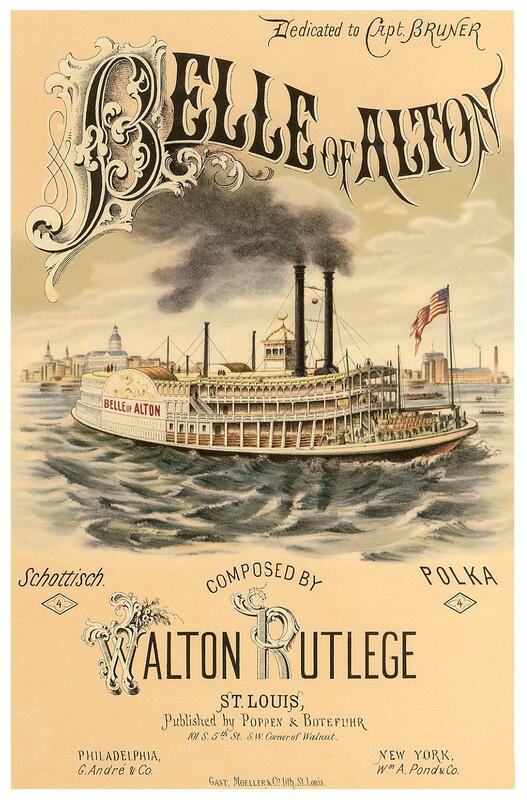 . .
One of my favorite reprints made by the Mississippi Lime Company (Alton, Illinois) of the sheet music cover for the "Martha Jewett Polka." 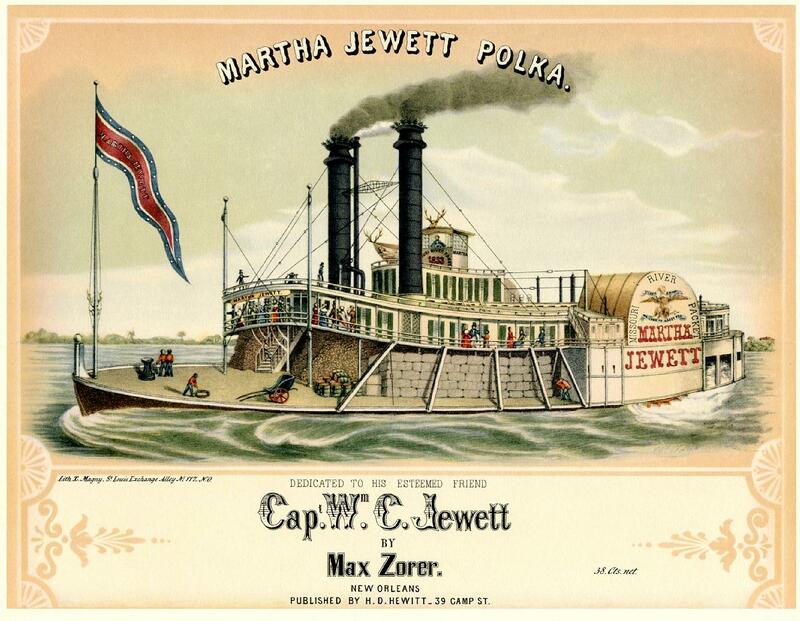 In 1852 the Martha Jewett was built in the Soap Hollow boat yard north of Holliday's Hill  above Sam Clemens hometown, Hannibal, Missouri. She was burned and lost at Cairo, Illinois on January 3, 1859. She ran on the Missouri, Mississippi and Tennessee Rivers. 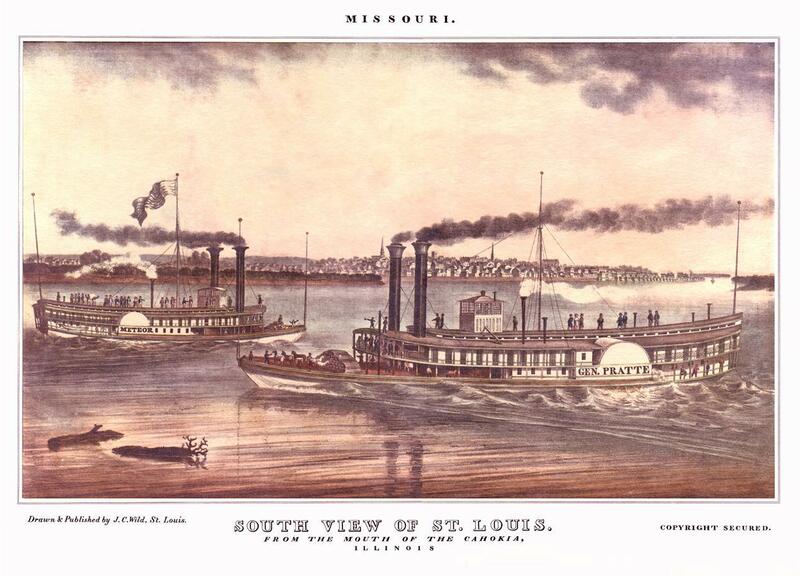 In April 1856 she ran bi-weekly between St. Louis and St. Joseph. 39 years after she burned (1895), her roof bell was installed in the belfry of a Presbyterian church at Cairo, Illinois. Mississippi Lime Co. of Alton, Illinois 1970 reprint of J.C. Wild's SOUTH VIEW OF ST. LOUIS, 1840. Some of these early boats had what amounted to a ship's mast amidships, mostly to fly huge flags from apparently and there may have been a crow's nest as well where someone used to smoking tobacco might have some tolerance for black sooty smoke from the stacks when the wind blew it aft. The brace attached to the pilot house and anchored on the hurricane deck is a feature which I've seen in other graphics of boats from this era including one of the MISSOURI from 1850. The later system of tying them down with guy wires may have been a little more effective in gale force winds. First home port, Alton, Illinois. Ran St. Louis-Alton. 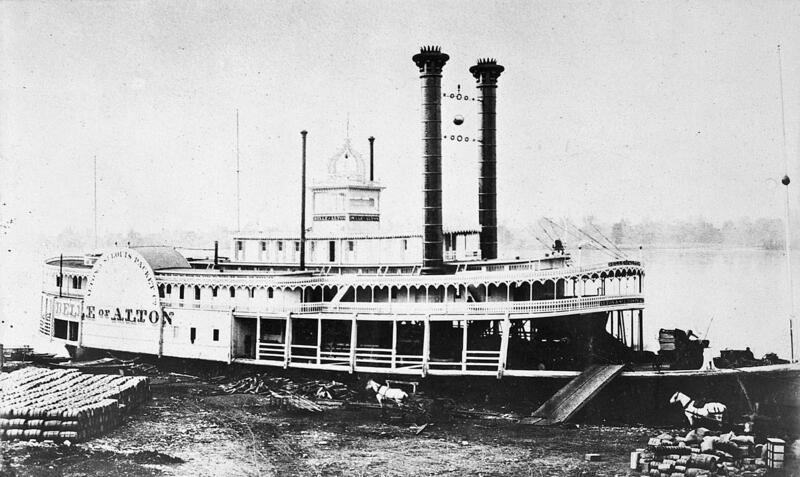 One of the first acts of derring-do in the Civil War was when 10,000 muskets and other munitions were removed from the St. Louis Arsenal under cover of night and taken to Alton, Illinois aboard this boat in April 1861 while sympathy for the South was running high in St. Louis. 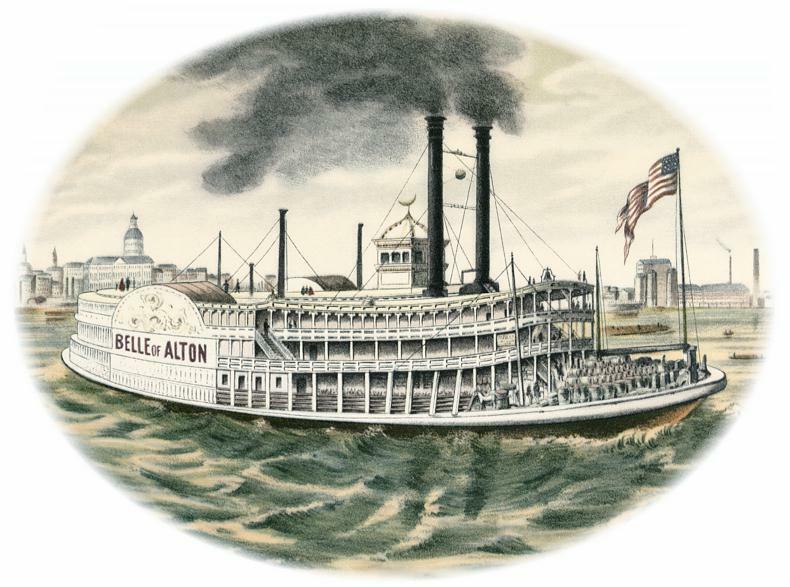 The boat landed at Alton before daybreak, the munitions were transferred to awaiting freight cars of the Chicago and Alton Railroad and delivered to Springfield, Illinois where the Illinois troops got their arms. She was with Grant's fleet during the Tennessee campaign and ran between St. Louis and Memphis after the war. 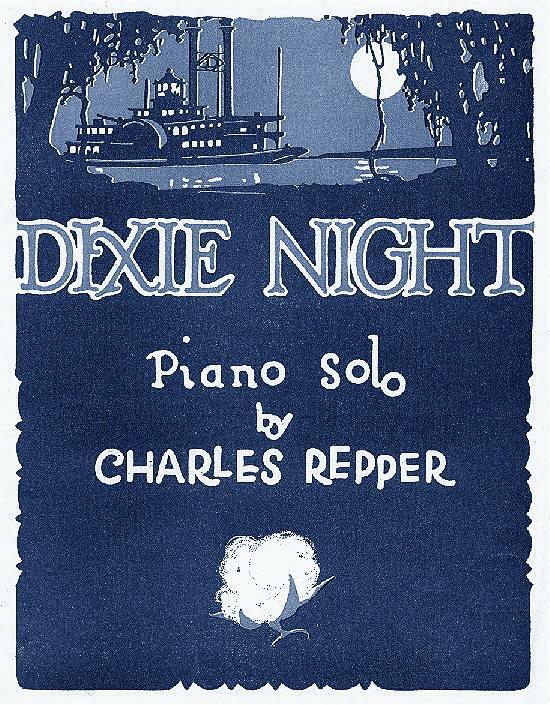 Nice graphic design with inventive lettering below a moonlit riverscape with silhouette of steamboat with some lights on and a cotton "boll" below the composer's name. I found this on a web search from an antiquarian book dealer in the Netherlands, pretty exciting. 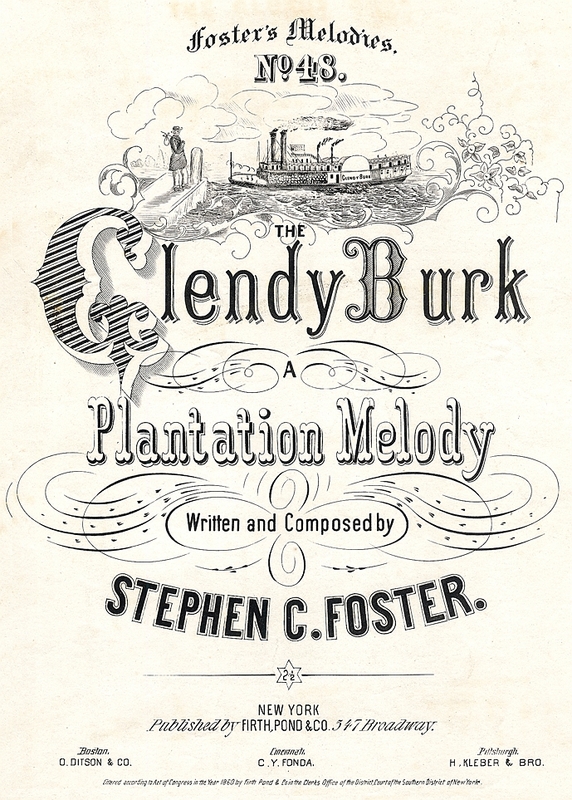 Stephen Foster's immortal celebration of a boat (I understand it was originally called the Glen D. Burke but I have a waybill where the name is shortened to Glendy Burke so it may have been rechristened with the nickname by "popular demand"). I should really get off my duff and make my own boat site with all the stuff I've got, sorry I've swamped you with a plethora of material you really don't have room for on your site, though I know you enjoy having it all in the archives in any event. And roll on de cotten bale. 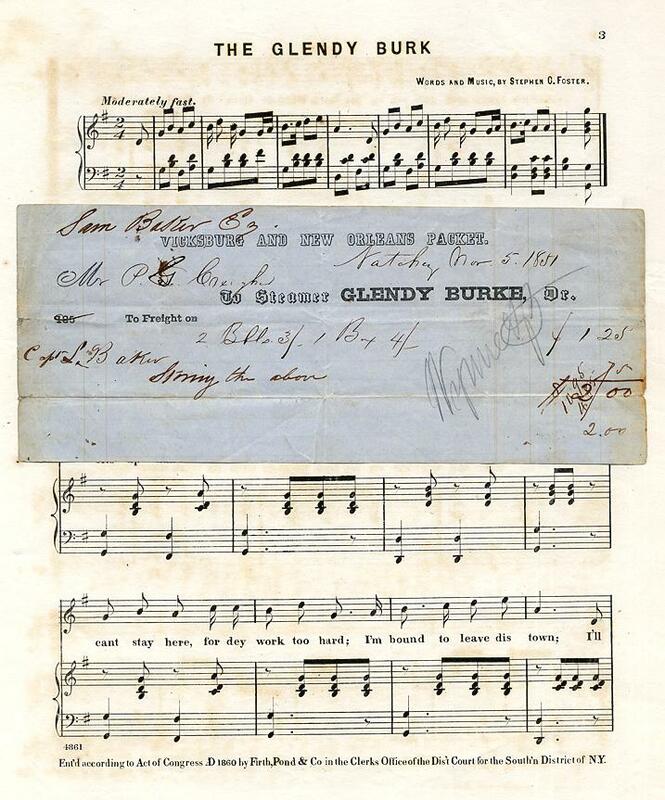 1851 Waybill from the GLENDY BURKE on page one of the sheet music. 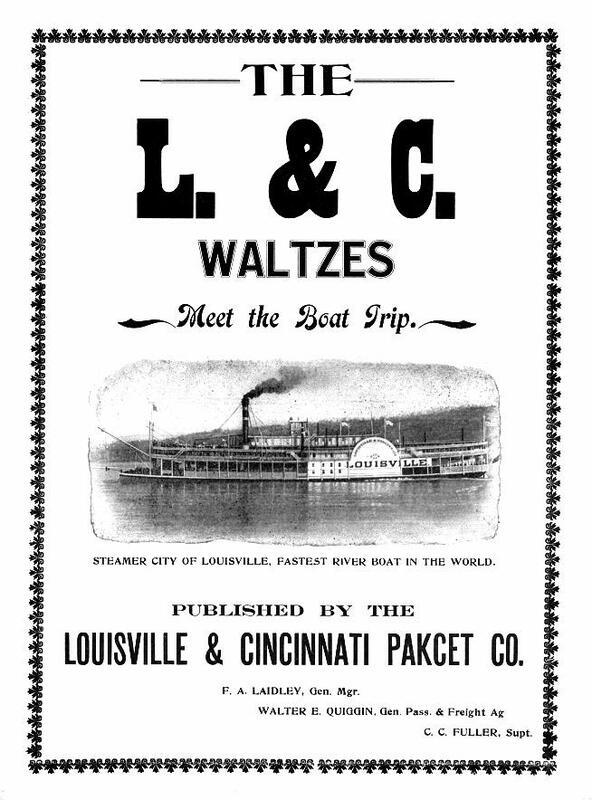 Sheet music over for L&C Waltzes dedicated to the CITY OF LOUISVILLE, Way Number 1095 sidewheeler 301 feet long built at Howard Shipyards in 1894. 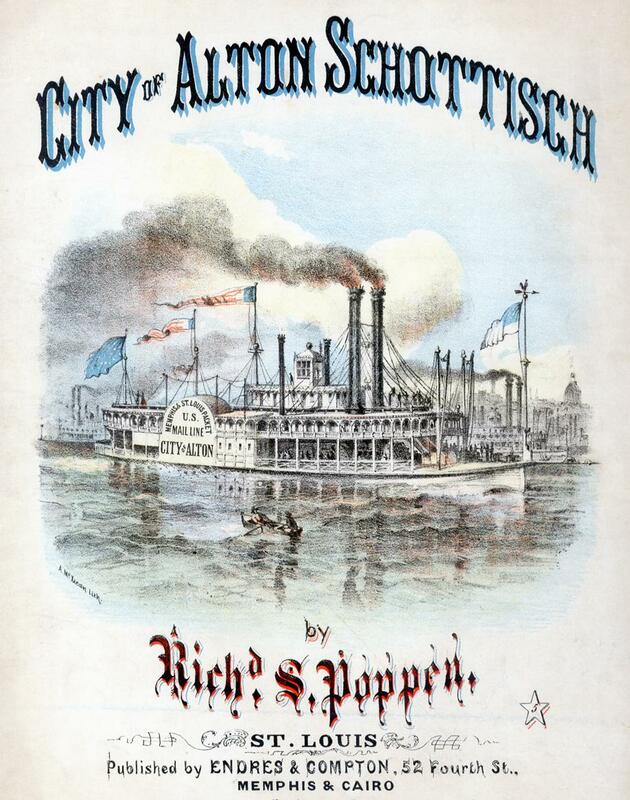 Owned by Louisville & Cincinnati Packet Co., operated on the Ohio River between Louisville and Cincinnati. 72 staterooms, slept 160, could carry 1500 passengers on excursions. Set speed records between Louisville and Cincinnati upstream (9 hours 42 minutes) and downstream (5 hours 58 minutes) Lost in the ice at Cincinnati, Ohio on January 30, 1918. 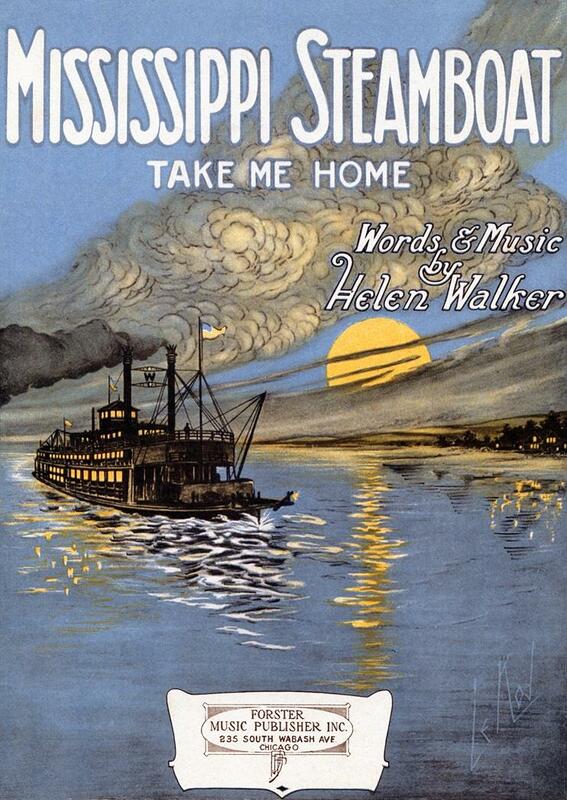 The rendering of the clouds in the sky on this cover for Helen Walker's song is the most distinctive feature of the art work. The clouds have something of an "Art Deco" design and may have been derived from the illustrations of Arthur Rackham. 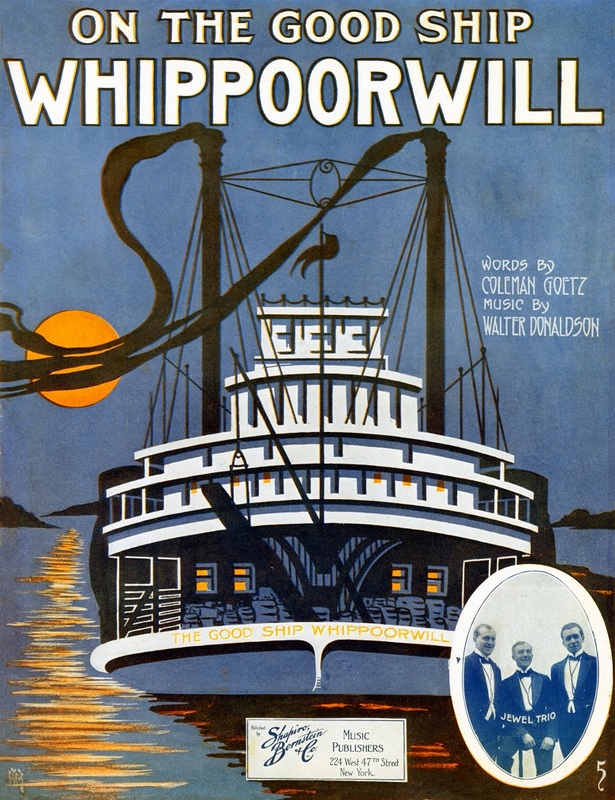 Walker's theme and writing is extremely conventional and evidently derived from listening to the many nostalgic songs of Stephen Foster and other sentimental composers and lyricists. Foster's "Old Folks at Home" (best remembered as "Swanee River") included the key phrase "all the world is sad and dreary everywhere I ROAM" which handily rhymed with HOME. Tempo - "Slow Waltz time"